AUDIBLE MAINFRAME is a live hip-hop band making a huge impact on the west coast. Their album "Transients,” releases August 25 and promises to be their best. AMF will host release parties on Aug. 21 in Boston, MA and Aug. 27 at the Viper Room in CA. (LOS ANGELES, August 7 2009) - AUDIBLE MAINFRAME is a six-piece, live hip-hop band making a huge impact on the west coast with their creative blend of old and new hip-hop and socially conscious message. Performing with well-known artists such as Damian Marley, Blackalicious and Arrested Development, the band’s powerful lyrics coupled with their high-energy shows is what sets them apart from the rest. Their long-awaited, full-length album "Transients,” is set to release on August, 25, 2009 and promises to be the most comprehensive AMF album yet. In celebration of the new release, the band will host east & west coast CD release parties with featured shows in their hometowns on Saturday, Aug. 21 at Harpers Ferry in Boston, MA and Thursday, Aug. 27 at the Viper Room in West Hollywood, CA. “Transients,” a 13-song, self-produced album, reflects the journey the band has been on for the last six years. It offers an eclectic mix of hip-hop, soul, and dance grooves; telling stories about the bands childhood memories, triumphs together, and staying positive through rough times. The album features a new lineup of instrumentation and presents an uplifting twist in today’s hip-hop world by incorporating a combination of acoustic & electronic beats and real musician flare. In comparison to their last album, “Transients” is a more mature AMF - lyrically, musically and spiritually. "When people listen to this album I want them to feel like The Future just punched them in the face,” says AMF’s Emcee and lyricist, Exposition (a.k.a. Expo). “We wanted to make the type of hip-hop record that made us fall in love with hip-hop in the first place: big beats, excellent musicianship, and next level throwback lyricism." 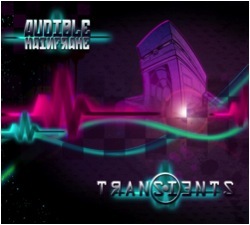 “Transients” will be available for purchase digitally on ITunes.com or online at CDBaby.com as well as their official website www.theaudiblemainframe.com. The CD can also be purchased at select retail stores and at their live shows. Originally from Boston, AUDIBLE MAINFRAME moved to the Los Angeles in 2006 and have been wowing crowds ever since. AMF includes six young musicians comprised of a vocalist, guitar, bass, drummer, keyboards/trumpet, and a DJ who combine their musical talent with the realities of everyday life in pure, hip hop form. Vocalist and Emcee, Exposition (a.k.a. Expo), takes the crowd on a journey of poverty, anger, happiness, and revolution through his masterful diction and rhyme. The AMF sound has been compared to such groups as The Roots, Rage Against the Machine, De La Soul, and Radiohead; however, their combination of old and new hip-hop gives AUDIBLE MAINFRAME a fresh, eclectic sound with a creative message that sets them apart from the rest. Riding a wave of awards and accolades brought with them from Boston, AMF has gained positive recognition, winning awards including the 2006 Mass Industry Committee Award for “Best Live Act” and “Best Underground Emcee". After taking first place in Boston’s 107.3 FM WAAF’s “Battle of the Bands” in 2004, AMF was named the first ever hip-hop act to perform live on-air on an all rock station. As a result, they were also chosen among a pool of local up-and-coming acts to record their debut album on Emerson Records, home of the nation’s largest college radio station 88.9 FM WERS. It didn’t take them long to add the West Coast scene to their resume by advancing to the finals of the 2009 International Emergenza Festival and winning the Star 98.7 FM & The District Weekly’s 2008 Battle of the Bands. AMF has created a remarkable hype within the industry being asked to support various superstars such as Damian Marley, Arrested Development, Common, Blackalicious, Tone Loc and Biz Markie. The band’s most notable collaborations include an opening act slot for Slick Rick, which then led to a backing band role for his national tour from 2006-2007. They later recorded a live band re-creation of the classic hip-hop album “Dah Shinin’ with Smiff N’ Wessun. For more information on AUDIBLE MAINFRAME visit their website at www.myspace.com/audiblem or www.theaudiblemainframe.com. An online press kit and tracks from their new album ‘Transients’ can be found at www.sonicbids.com/audiblemainframe. For further information on the band, gigs, releases, merchandise, photos and downloads, or to set up an interview, please contact Kim Koury kim@spinprgroup.com or Amee Jana amee@spinprgroup.com at SPIN Public Relations. Simply put, Spin Public Relations is a boutique public relations firm with large firm experience. Our firm is an eclectic group of individuals who share a strong bond to one common philosophy and vision. Although not the Brady Bunch, we are a family whose individual talents come together on a daily basis to create dynamic and powerful public relations campaigns. We concentrate on client sustainability and acknowledge that our success depends on providing a measurable return to our clients' investments. Our focus is client service. Partnerships. Passion for our clients. Straight talk, real answers. Results that achieve and exceed expectations.